I’ve only lived in three places in the United States and it’s been a strange coincidence that two of them were fixated on historical figures. Upon moving to Tuscaloosa, Alabama, I quickly discovered that images of storied Crimson Tide football coach, Paul “Bear” Bryant, were near inescapable. Go to the bank, the doctor’s office, even McDonalds, and there would be the Bear–usually squinting off to the horizon, seemingly contemplating his next national championship or victory over Auburn. I now view this as rehearsal for life in Springfield, Illinois, which boasts the most famous American in history as a former resident. Abraham Lincoln is everywhere in this town and, in part, the very engine that keeps it running (sorry state government, you’re a distant second). The message I received as a foreigner and a newcomer in both places was clear: either be part of this cult of personality or be an outsider. Call me a bandwagon-jumper, but I happily got on board in both instances. That being said, I was already predisposed to ride along with Lincoln. He’s at the epicenter of my chosen field of study and my job with The Papers of Abraham Lincoln involves immersing myself in his world for at least 7.5 hours a day. That, in part, is why I attended a fake funeral this past weekend. Now, although I have an investment in Lincoln’s life and legacy, I was somewhat troubled by the idea of reenacting his funeral. Indeed, I’m skeptical of the educational and practical value of reenactments in general, and the benefits of reenacting a funeral seem even more elusive than reenacting a battle. I’m a little less dubious of reenacting’s near-siamese twin, living history, only because I’ve seen it done exceptionally well in places like Colonial Williamsburg, but I have a hard time labeling the funeral ceremony I witnessed as living history because it did not seem expressly designed to educate. There was clearly education taking place, but usually in public addresses by scholars and other VIPs, not the aspects of the reenacted funeral itself. So, I went in very trepidatious and never felt totally comfortable with the idea, but I must admit I left yesterday with a better attitude about the whole affair. 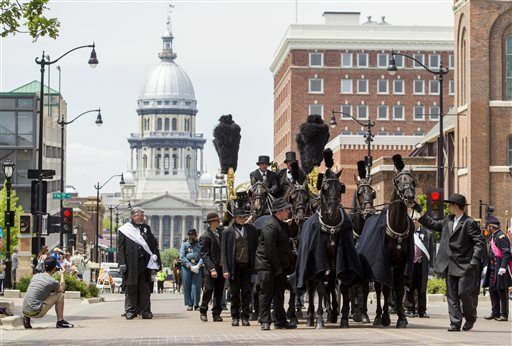 Although the idea of dressing up as a nineteenth-century person and pretending to attend a presidential funeral seems a little silly to me, it was all pretty well-done and as respectful as something like that can be. Some aspects were particularly remarkable, such as the hearse, which was meticulously recreated and beautiful (the funeral train was reportedly also very well-done, although I didn’t see it in person). I never experienced anything approached what reenactors call a “period rush,” but everything seemed very professional and, as far as I could tell, accurately staged. But it was really the reactions of those around me that forced me to shut down my cynicism. I wanted to treat the reenactment as an intellectual exercise but I think it worked best as an emotional experience. I witnessed some people actually cry as the procession passed by them. Indeed, one of the most moving sights I witnessed all day was a row of actual veterans–each holding American flags–lining the path of the procession as it made its final turn onto 3rd Street toward Oak Ridge Cemetery. Here was a group of men honestly showing their respect for a president who restored the Union, helped end slavery, and fell to an assassins bullet 150 years ago. It is in this context–a purely emotional and nostalgic one–that the funeral reenactment makes the most sense. And the Springfield context matters too. I understand that a lot of the people in attendance (and most in the procession itself) were from out of town, but I think the procession was most effective for long-time Springfieldians as a way to not only express a legacy of grief over losing their most famous resident but also as a means of reminding themselves of the pride Lincoln’s memory can create in this town. Springfield has long had its share of economic trouble and Lincoln is a rallying point for the town that bridges all classes and ethnic groups. It was especially noteworthy to see African American families paying their respects, especially in the north side of town where there is a higher black population. This is a rare sight at battle reenactments or even on battlefield parks. Springfield came out to honor Lincoln’s memory yesterday on the tail end of the sesquicentennial. It may have done so in a way that I find a little tacky, but how can getting an entire city to think about Lincoln and the Civil War for a day be a bad thing? Good post, Christian. I must admit that when I visited the Lincoln Presidential Library Museum, in the last part that takes you thru a recreation of walking by his coffin, I got a little choked up because I had a mini “period rush.” In fact, it was one of the most emotional moments I’ve had at a history site. The only other times in my life that compare to it was the time you and I walked in the footsteps of my ancestor’s Alabama regiment and emerged from the woods in the Slaughter Pen at Gettysburg (and I charged Little Round Top), and when we all stood there deep down in the church tomb next to Abigail and John Adams in Braintree. Of course neither of those things involved living history. I am a bigger fan of living history than you are (not reenactments), so as I’ve seen you do in Williamsburg, I am glad you got to “suspend your disbelief” and just give yourself over to the tackiness for a moment or two. Wish I could have been there, but then again, I might have been moved to tears. Hi Glenn. I’m glad you brought up the funeral room in the museum, because it always works on me too. I’ve been here for 2 years now, but I still get a little emotional pang whenever I pass through that room, even if I’m just trying to get from one end of the building to the other. Sometimes history can just be purely emotional.